Mushrooms! Oh my gods MUSHROOMS! 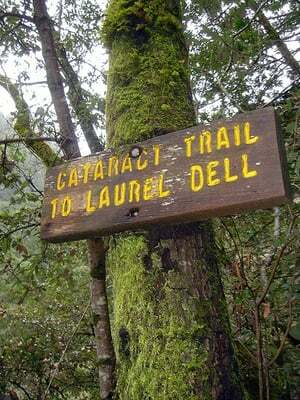 I Returned to Mount Tamalpais with Colin on Wednesday thinking I’d really like to make it farther down the Cataract Trail to the falls since they’re often credited with being the most impressive waterfall in the bay area. I have to say they were gorgeous, but I was still way more excited about all the mushrooms I found. We haven’t had rain in about a week, so I figured other foragers, both human and animal, would have gone though and taken anything good by now. Just in case, I strapped my knife to my backpack and tucked a couple paper bags into my pocket. Good thing I did, because, boy, was I mistaken! We brought home about as much as we could carry in the fabric grocery bag I’d brought along on a whim. By the end of our hike we were loaded down with a couple pounds of what I’m pretty certain is Phaeolus Schweinitzii, also known as the Dyer’s Polypore. It grows on fallen trees and burried deadwood, and is easy to spot because of its bright yellow edge and velvety brown top. It feels like a wet sponge to the touch and will hopefully create a golden hue in my yarns when I dye this weekend. Half of the Dyer's Polypore I collected. Another cool dying fungus I found is the Jack-O-Lantern Mushroom (Omphalotus Olearius) which is used to produce a purple dye tone. I’m really excited about this one since purple is always a hard color to capture and the swatches I’ve seen dyed with this are some of the richest shades of violet I’ve seen. I also found lots more of the Delicious Milk Caps (L. Rubrilacteus) and a couple more Coccoras (Amanita Lanei). Delicious Milk Cap which we nicknamed the Bleeding Milk Caps because of their red latex. We spotted a couple other mushrooms I haven’t IDed yet. If you have an idea of what they are, let me know. This one is a really beautiful example of the Sulphur Tuft (Hypholoma Fasciculare) and I’m sincerely wishing I’d brought a bunch home since it turns out to be a great dying mushroom as well. These poisonous little Sulphur Tufts create a pale yellow dye. I’m definitely hooked on this new hobby. Mushrooming is a really great motivator to get me hiking again. I suffered a knee injury two years ago which limited my physical ability to hike and backpack like I used to. Because I lost my access to the great outdoors for a while, I became discouraged and felt unmotivated to even try hiking very much. It took me a while, but I’ve realized now that the only way to get back onto the trails I love is to start small. I’m trying to go hiking at least once each week and mushrooming is a bit of extra mental effort that means I get a reward for my efforts at the end of the day. I’ve been feeling better about myself and about my weak knee and am slowly getting more confident. It’ll be a while before I’m backpacking the Sierra again, but hey, it’s November. I’ve got ’till spring to get there, right?